Bringing Heaven to Earth is a group sound ceremony with astrologer Beth Ylivasaker and Lea Garnier which focuses on the influences of the planets and specifically the moon cycles. Our ancestral relationship to the cosmos and sacred sound induce varying degrees of “shamanic” experiences. The sound vibrations of sacred instruments help bring the heavens to earth and allow us to travel to portals of higher levels of consciousness, expanding the boundaries of our world, and clearing space in order to bring down these powerful energies for the good of all. We bring in that awareness with the resonance of the gongs, himalayan singing bowls, crystal singing bowls, tuning forks and peruvian whistling vessels. Different instruments have different qualities and sound consciousness, and so each sound bath or sound ceremony is working with an intention specific to the energies of the sound leading the ceremony. A CLOSER LOOK AT SOME OF THE SACRED SOUND TOOLS used during a sound bath…. Crystal sound frequencies generate vibrations that stimulate the etheric body as well as the physical body. 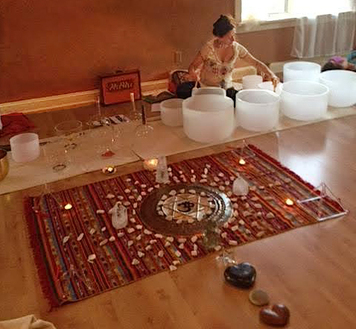 The sound of the Crystal Bowls helps the client reach a Still Point, open to receiving physical and emotional healing, and can stimulate access to intuitive knowledge. Part of the nature of crystal is to amplify, and so when used with intention for healing it can help us create a solid ground to surrender our negative emotions, and to increase the vibrations of our positive love-light body. Gongs have a very deep voice, and have the effect of clearing or washing. It has tremendous potential for healing and rejuvenation. 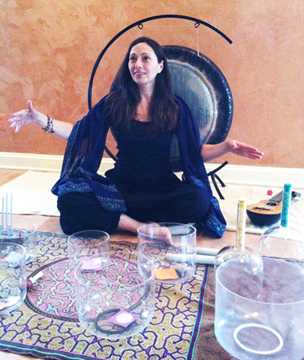 The gong covers the full spectrum of sound, it vibrates all the cells and bones and organs. You feel an influx of energy coming from it into your body as well as hearing it. 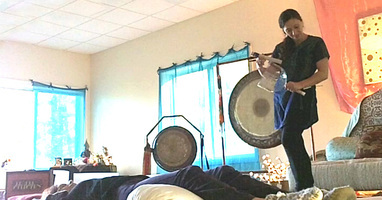 Gongs are a force of energy, like a divine engine affecting the body’s meridians. By and large, after it’s over you just feel great.. you feel like you have been healed by the spirit of nature. In an experiment with cancer cells, the rich overtones of the gong being played for 21 minutes caused the cancer cells to disintegrate and ultimately explode. Himalayan singing bowls have been used in healing since ancient times. They help bring us back into alignment with universal flow. The more we experience these instruments, the more they anchor this alignment. Experiencing repetitive patterns with the bowls help us remember at a visceral level how to be whole. Himalayan bowls produce a uniquely warm vibration that feels great. They have a clear fundamental tone that is very pleasant, and multiple harmonic overtones that sound angelic. The harmonic overtones interact with our nervous system and can elicit surprising responses including wonder, joy, creativity, personal breakthroughs, deep relaxation and support profound healing experiences. Tuning Forks combined across specific tonal intervals are believed to cause cellular changes, and has been proven to spike Nitric Oxide. This important molecule sends a signal to our cells to relax and produces benefits such as enhanced cell vitality, vascular flow and heart healing. The forks also destroy bacteria and viruses at a micro level which naturally enhances our immune system and increases our ability to prevent and fight infections. They increase resistance to stress and enhance greater levels of energy and stamina. They can sharpen mental clarity and diminish states of depression due to the balancing of the autonomic nervous system. Tuning forks also improves digestion and natural cleansing. Peruvian whistling vessels brings transformation and healing by inducing a trance like state. For over two thousand years, different cultures in Peru produced vessels psycho acoustically tuned. These instruments produce vibrations that induce an expanded state of consciousness different from anything known today. They stopped producing their vessels when conquistadors entered their land. They did not share the vessel experience with the invaders. For hundreds of years the vessels have remained silent, waiting for this point in history to reawaken. Mantra & Toning One of the most powerful instruments for healing and transformation is the human voice. Singing, overtoning and the chanting of mantras profoundly affect our well-being due to their therapeutic and calming influence. Studies have been done that show that the human voice produces the most dramatic results in transforming cellular structure, exploding cancer cells and energizing healthy ones. Sanskrit mantras are energy based sounds that vibrate throughout the body and chanting these sacred sounds of power can bring us to a higher level of consciousness. The human body is over 70% water and since sound travels five times more efficiently through water than through air, it is an excellent conductor for sound and vibrations. Icaro Tradition tells us that icaros are songs that the plants themselves transmit to healers only after they become physically, mentally and spiritually prepared to receive them. Icaros are songs of teaching, healing, invocation and protection. There are icaros that sooth the spirit, and allow us to see not only what is there and is not seen, but also what is felt, and what others feel. These songs let us see the past, and what is yet to come. Other instruments for healing such as didgeridoo, shruti box, bells, bones, drums, flutes and stringed instruments when used in combination with scent and feathers can adjust imbalances of the spirit, and can resonate our energy centers or chakras.